I once sat on one of a row of kerbside staddle stones while my wife was in a gift shop on the Devon coast. 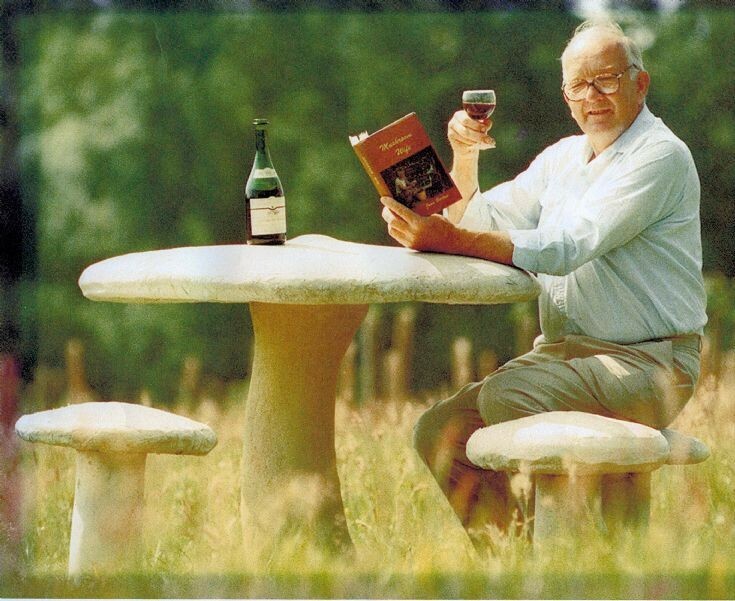 This alerted me to the thought of making a group of concrete mushrooms as seating to celebrate the new millennium in Church Covert field, just to the south of Slaugham churchyard, instead of an envisaged wooden seat. Durable and attractive they would remind us to the fact that, fifty years earlier, demobbed airman Hugh Barton living with his wife in a war-time Nissen hut at Buchan Hill, Pease Pottage set up trials for mushroom growing in another Nissen hut in Geoff Barr’s garden at Bosworths, Slaugham. They both worked at Handcross Nurseries and had seen the lucrative profits that punnets of mushrooms were making when sent to London restaurants. Staddle stones are mushroom-shaped stone supports once used to keep a wooden platform for corn stacks above ground, away from vermin. However these have always been known as Steddle stones in Sussex, and this is confirmed in a book of 1875 concisely entitled “Dictionary of the Sussex Dialect and Collection of Provincialisms in use in the County of Sussex” by William Parish. The photograph is by kind permission of Brighton Argus Newspapers, and shows me drinking wine and reading Joan Barton’s book, The Mushroom Wife. Hugh Barton set up his own mushroom farm in Church Lane, Lower Beeding and a minibus was used to transport staff from Handcross each day. In one year they produced one million punnets! Joan Barton's book "The Mushroom Wife" is a pleasant and informative little biography. Are you Mr and Mrs Shopland's son who lived at The Gate Lodge, the little round tower bungalow at the entrance of Tilgate Forest Lodge? My family Pescud lived at Tilgate Forest Row and Mrs Shopland made some clothes for me when I was younger. My grandfather, Thomas Cheal, worked on the estate as a carpenter and I spent my child-hood walking around the fields and forests. I worked for a short time for Tony Allom, grandson of Mr. O. T. Norris. but then he sold Tilgate Forest Lodge and that's when it was split up. We knew Mr and Mrs Beard very well and also her auntie who lived in Tilgate Forest Row down the Row. It is nice to hear these things as I now live in Norfolk. Anne, may I reply in response to your query as the son you referred to passed away nearly four years ago. He has been greatly missed by everyone who knew him; not least as a regular contributor to this website. May I suggest you read about his full and active life at picture #1272. In recent years both Sid and Helen Beard have also passed away, again after serving the local communities throughout their lives together. We am so pleased for having found all this information; thank you very much! Sad that Mr. Arthur Shopland passed away. As for Joan Mary Barton and Hugh Joseph Barton, I've just written a blogpost about her book. They had been long-time mushroom industry friends of ours. I'm really hoping that some Barton relatives will find it!